To participate in any of our trips you need to (1) Sign a Waiver, and (2) Complete the Registration form. Click here to Register now! Winter 2020 is fast approaching, and ski lodge space is hard to come by these days. Fortunately we’ve secured, as always, some of the best ski trips on the planet for 2020 and have room for you! Don’t wait though, we will sell out. To secure your booking, deposits for our ski trips are $1000 and the balance is due 3 months in advance, except for our Svalbard trips which have a special payment schedule. We’re still working on the details of a few of the trips — stay tuned! Selkirk Lodge – Once again we will kick off the ski lodge season with a week at Selkirk Lodge. You cannot beat the Selkirks in early January for blower powder skiing, and Selkirk Lodge is hands down the best ski touring destination in the Selkirk mountain range — for both the unbelievable terrain and the spacious newly renovated lodge — and easily one of the top three in the world. Come find out why. $2775 CAD/person (Currently $2,212 USD / €1,956 / £1,692). SL20 (January 11-18). JaPOWaganza – “The best tree skiing in the world” — bottomless powder skiing, hot-spring “Onsens”, monkeys, quaint hotels, lift-accessed ski touring, and an amazing food culture. Come see why Japan has become such a popular ski destination. Guided by Tom Wolfe and co-guided by Jun Yanigasawa, a Japanese ski guide living in Canada who knows the area as only a local could — we’ll stay away from the crowds and get a taste of authentic Japan. $3750 CAD/person (Currently $2,925 USD / €2,586 / £2,236) (no GST). JP20 (January 25-31). Burnie Glacier Chalet 1 & 2 – the legendary Burnie, land of towering blue seracs and endless ski runs taking you from high alpine down 1500 m to the old growth timber valley floor. Burnie is the best, and February is the best window for powder skiing from mountain top to valley bottom. BG20-1 and BG20-2 are fully booked, no waiting list (February 2020). Valhalla Mountain Lodge – March 7-14, 2020 – 4 spots left – THE legendary Kootenay ski lodge, and a peak season week. 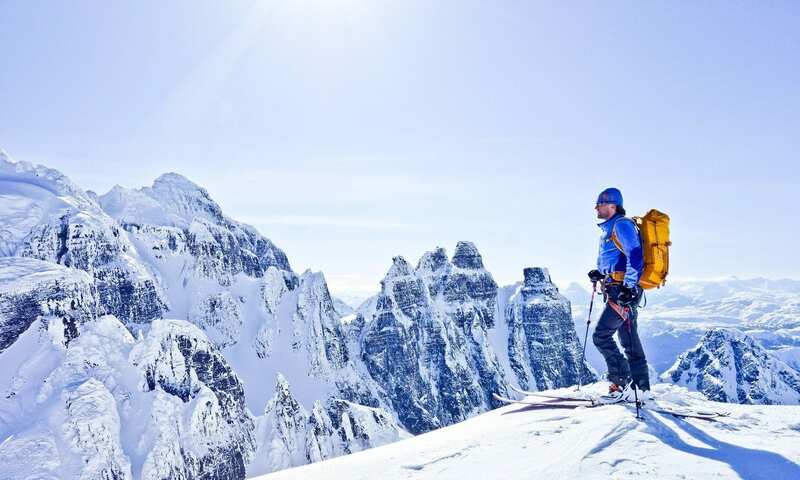 Valhalla Mountain Lodge (not to be mistaken with VMT Touring) combines the incredible tree skiing of the Koots with the stunning alpine skiing of the Valhallas. Book before it’s gone! $2775 CAD/person (Currently $2,212 USD / €1,956 / £1,692). VM20 (March 7-14). Spots available, book today! Burnie Glacier Chalet 3 & 4 – March 2020 – the legendary Burnie, land of towering blue seracs and endless ski runs taking you from high alpine down 1500 m to the old growth timber valley floor. Burnie is the best, and spring is the best time for the epic ski mountaineering tours Burnie is most famous for. $2675 CAD/person (Currently $2,100 USD / €1,857 / £1,606). BG20-3 (March 20-27), BG20-4 (March 27-April 3). Spots available, book today! Bow Yoho Traverse – Our third year running, this is the Deluxe Bow Yoho with a price tag that isn’t as high as you’d expect when you consider what’s included. Starting the trip in a 4-star hotel with a gourmet dinner and breakfast sets the tone for this one. The next day: ski with a light pack up to Bow Hut to find you food waiting for you courtesty of our portering staff. And if that weren’t enough (we said we set the tone on night 1 right?) carry over to Guy and Stanley Mitchell huts with light packs again to find the remaining food miraculously waiting, again courtesy of our fleet footed porters. With a couple of lay-over days for bagging classic peaks and epic ski runs, this is as close to Euro luxury as you can get on the Wapta. $1795 CAD/person (Currently $1,440 USD / €1,273 / £1,101). BY20 (April 5-11). Spots available, book today! Svalbard Ski & Sail – Yes, we’re doing it again! For those of you who have been sitting on the fence about our incredible ski touring trip in the Arctic Archipelgo of Svalbard, don’t let another year go by without booking a spot on this trip of a lifetime. This voyage, our third season of Svalbard “Ski and Sails”, is on the s/v Noorderlicht. $7895 CAD/person (Currently $6,149 USD / €5,438 / £4,702) (no GST). NO20-1 (May 2-9) NO20-2 (May 9-16), plus 3-day presail options LY20-1 (April 30-May 2) and LY20-2 (May 6-9). Spots available, book today! Prices are in Canadian Dollars (CAD) and do not include 5% federal sales tax (GST) exception being Japan and Svalbard trips which are not taxed (being international trips). Here’s a list of our available 2021 dates, please contact us for pricing, details and booking.